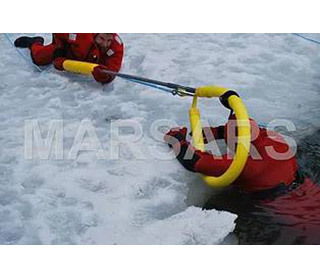 MARSARS’ modern approach to ice rescue minimizes the potential risk of being grabbed and climbed on. The NFPA suggests that victims be placed in independent positive buoyancy upon contact. 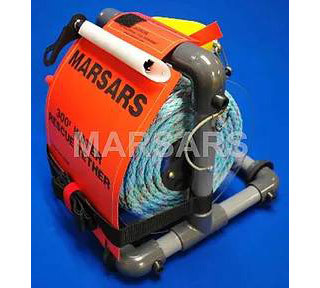 MARSARS’ ice rescue tether bags and reels of 300′ or less, feature a rescue sling hook-up point that is pre-rigged 6′ from the tether’s outboard terminal end. 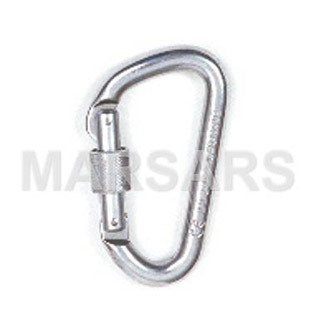 Reels greater than 300′ do not have a sling hook-up point. 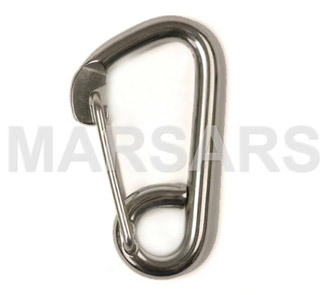 For assured escape, our tethers include a non-locking freeze-free carabiner. The buoyant float prevents disconnected terminal end from sinking. 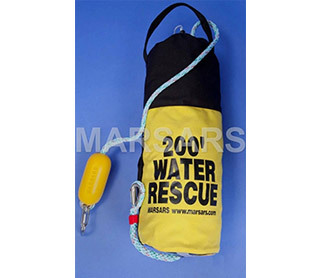 As a cold water rescue flotation device (RFD), the MARSARS non-constrictive sling is passed by hand or pole from a safer distance. To minimize ice mantle breakage, a sling attached pole is extended for child rescue atop thinner, unstable ice. 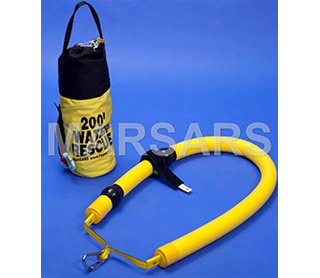 Ready for rescue, our high-quality MARSARS 200′ or 300′ Ice Rescue Tether kits offer the following features: pre-rigged with stainless-steel carabineer and rope thimbles. 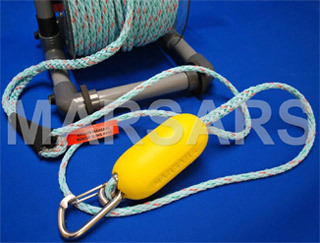 Yellow float prevents disconnected tether from sinking. When two teams are deployed at night; to avoid confusion, bag’s base holds optional colored identity light. Tether bags available in red or yellow. Optional military grade lights are available in red, yellow or blue. Both water and ice rescuers are placed at risk of being grabbed and climbed on. To counter this risk, passing buoyancy to a victim from a distance, has over time, proven to be a safer method that works. 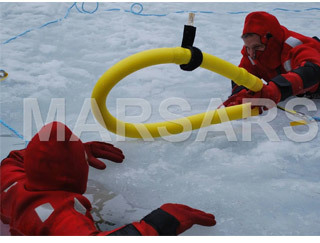 To increase ice rescuer’s safety, MARSARS has refined a method that uses a handle to extend buoyancy from a greater distance. 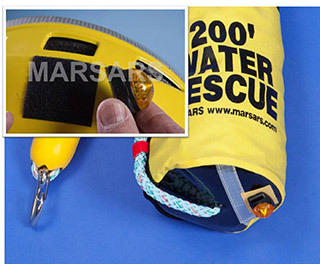 All MARSARS’ ice rescue reels come rescue-ready with buoyant pre-rigged 3/8″ diameter line, carabiner and float. Line strength of all hollow-braided “B” series line reels is 3,500 lbs. Blue-colored (3-strand construction) line reels offer strengths of 3,700 lbs. 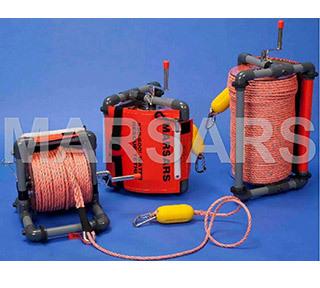 All MARSARS’ reels float with or without rope and non-locking carabineers are provided for assured escape from life threatening situations. 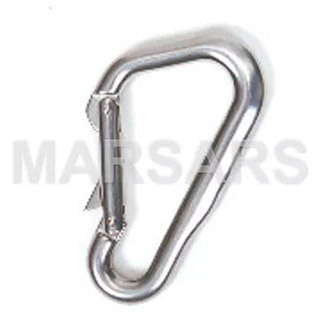 This non-rotational line is needed for inhaul tethering of our IRSS Shuttle. 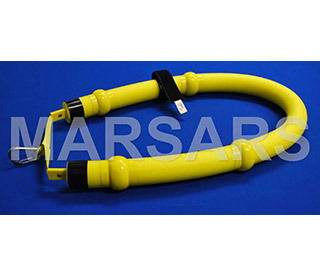 All “B” series Ice Rescue feature 300′, 550′, or 850′ of 3/8″ (9mm) diameter, 3500 lb strength hollow-braid rope. 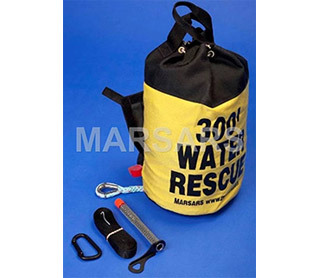 For limited visibility, all MARSARS Tether Bags and Ice Rescue Reels come with 2″ Velcro™ square for optional identity light attachment. 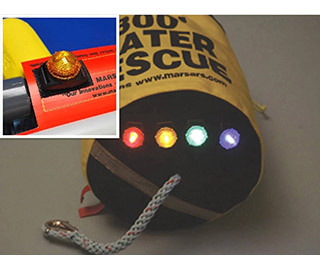 Why use colored lights instead of different colored rope? helmet and tether reel or bag avoids confusion. 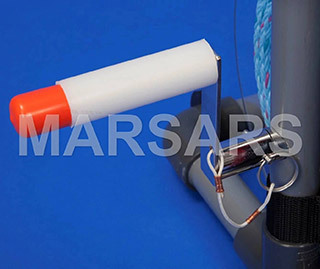 All MARSARS Ice Rescue Tether Line Kits and Rescue Reels feature the H13 Hook with Thimble. Quick connect ropes or slings. Non-locking features assured rapid emergency disconnection. 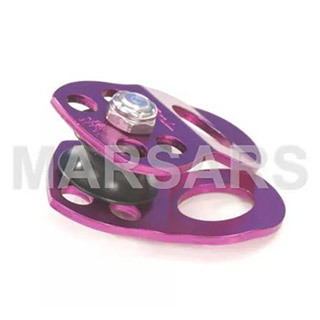 Not intended for high-angle or below-grade use. Black, annodized aluminum. 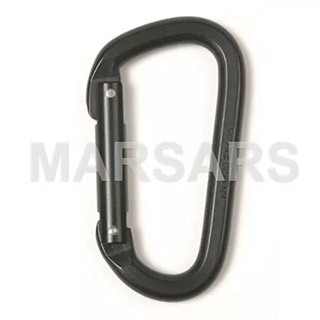 The Aluminum Locking “D” Carabiner features an offset locking mechanism that offers high strength and reliability. Stainless steel gate and sleeve insures a lifetime of smooth action and trouble-free service. 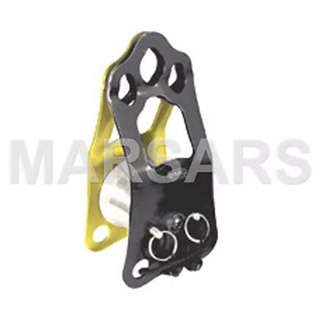 SMC stainless screw locking gate features smooth action and assures protection against unintended disconnection. 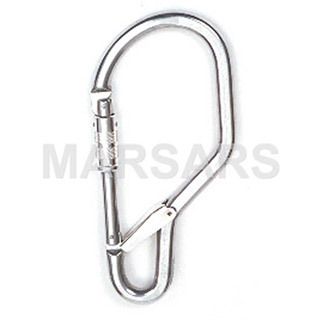 The R/C Skiff Hook carabiner features stainless steel construction. 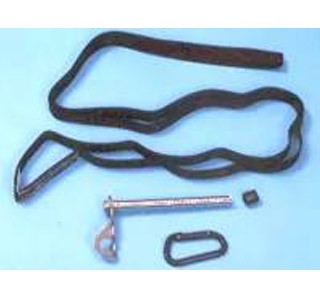 Spur attached to gate allows carabiner to be remotely opened or closed. 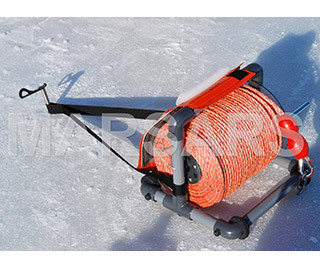 Small and compact, the Ice Rescue Micro Pulley is designed for a 1/2″ 12mm rope capacity with 7,000 pound minimum breaking strength. 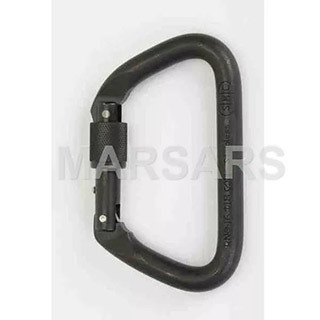 SMC’s Knot Passing Pulley (KPP) is an entirely new compact high performance KPP. 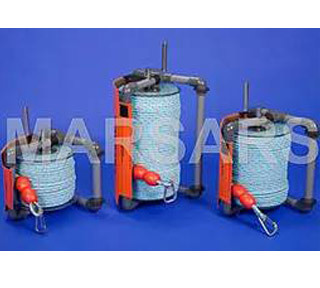 Adding to its versatility, this KPP may also serve as an edge roller for rope protection.